Almost every runner has experienced muscle cramps while running at one time or another, especially if you get muscle cramps while running a marathon or after running in the summer. I’ve heard countless stories from friends, family, and clients about cramping up in the last few miles of a marathon and barely being able to even walk. Sometimes the cramps can be worked out, but often they persist and there are no strategies for overcoming muscle cramps while running that can save the race….or even the entire training season. The most frustrating thing may be that they can come out of nowhere, and what causes muscle cramps while running is somewhat unknown. Muscle overloading and fatigue cramps from overuse. 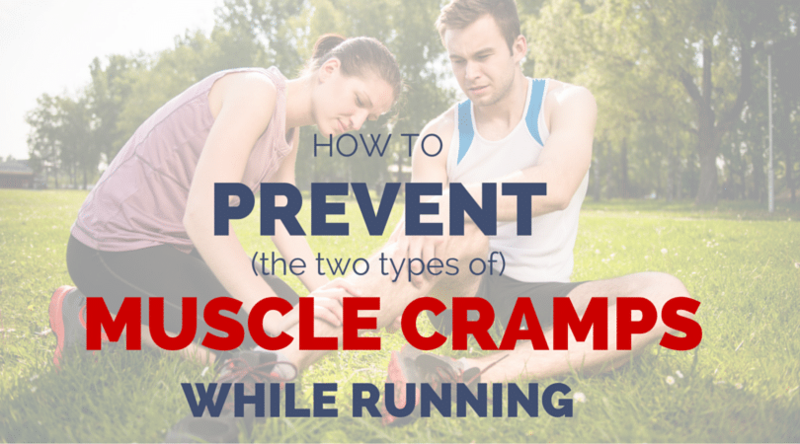 The cramping is painful in the muscle (often the calf muscle) that is being overworked. Electrolyte imbalance muscle cramps that develop due to extensive sweating and low sodium. These cramps may occur even if there is no muscle overuse and cramping may occur in multiple muscle groups. It is important to determine which type of cramp you are experiencing or are prone to getting, so you can prevent muscle cramps while running. In this article, we will take a closer look at the two types and recommend our favorite remedies for muscle cramps as well as what to do to avoid muscle cramps after running in the future. But before we begin, just make sure it is actually cramps that you are experiencing. Runners often confuse bonking and fatigue during a marathon with cramps. This type of muscle cramp occurs from repeated or extended loading of a particular muscle group and muscles that are in a shortened position (calf muscle cramps while running). These muscles that remain in a shortened position while running are the most vulnerable. The true physiological explanation for how the cramping develops is a bit complex, but basically the neural mechanisms that are supposed to inhibit muscle contraction are depressed and excitatory activity (chemical and electrical synapses that fire the muscle) of the muscle fibers is enhanced. The result is an intense, sustained involuntary muscle contraction. Remedies to treat muscle cramps? As mentioned earlier, muscle overloading and fatigue cramps remain localized to the muscles that are being overworked. Nutritionally, there isn’t much you can do to prevent overload and fatigue cramps. Typically, these types of cramps are training related, so you’ll need to incorporate some innovative workouts within your marathon training schedule or training plan to help prevent the possibility of fatigue cramps. My advice is to do more workouts where you challenge the body to run faster as it gets tired or practice running on tired legs. This will help prepare the muscles for the fatigue they will experience during the race and be better prepared to run relaxed. What workouts will help to prevent muscle cramps in races? Running steady runs the day before a long run, which will simulate running the last half of the race as opposed to starting a long run with fresh legs. I also recommend what we call combo workouts. Combo workouts basically entail doing some type of tempo run or hilly run to tire they legs and running a set of fast 400 or 800 meter repeats the latter part of the workout to practice generating explosive muscle contractions when the muscles are fatigues. Finally, I definitely recommend including more strength work into your training to increase you efficiency, which means your muscles will need to contract fewer muscle fibers to perform at the same level of effort/pace. This type of cramp is typically due to extensive sweating and significant electrolyte losses, especially sodium and chloride. As the duration of exercise increases and sweating continues, a whole body sodium deficit may develop, especially if the sodium and chloride lost in sweat are not replaced promptly. These electrolyte changes and the accompanying fluid shifts in the body can cause certain neuromuscular junctions to become hyperexcitable, resulting in cramping. Dehydration is very often an underlying cause. Take in a high-salt sports drink or 3 grams of salt mixed into 0.5 L of a regular carbohydrate sports drink. Enduropacks is a electrolyte spray that can be used in any drink, if you are looking for something to keep with you. Potassium, calcium and magnesium supplements are not recommended. Try to match sodium intake closely with individual sodium losses through sweat. If you frequently struggle with the electrolyte deficit cramps, consider changing up your pre and during run fluid choice. Most sports drinks on the market are what sports scientists call isotonic, which means they contain a carbohydrate solution that is at 6-8% concentration. Because the sugar concentration of most sports drinks is higher than that of most body fluid, they are not readily absorbed into the blood stream and are thus not optimal for hydration. Accordingly, your best choice before and during your run would be a heavily diluted sports beverage or water with an electrolyte spray. By diluting your sports drink or using electrolyte substitutes, you provide your body with the best combination of electrolyte replacement and immediate absorption. Likewise, electrolytes, especially sodium and potassium, reduce urine output, speed the rate at which fluids empty the stomach, promote absorption from the small intestine, and encourage fluid retention. Bergeron, M.F. Muscle cramps during exercise- is it fatigue or electrolyte deficit? Curr. Sports Med. Rep., 7;4: S50-S55, 2008.Eichner, E.R. The role of sodium in ‘heat cramping.’ Sports Med. 37:368-370, 2007.Schwellnus, M.P. Muscle cramping in the marathon: aetiology and risk factores. Sports Med. 37:364-367, 2007. I’ve had a few cramps while running, but they were quickly gone. Still, I wouldn’t want to risk a bigger one the next time I take my exercise to the next level. Thanks a lot for sharing this article. Hi Pauli, are you sure it is cramping, did you read this post of ours? May help you https://runnersconnect.net/running-nutrition-articles/bonk-fatigue-cramp/ If you follow our advice, it should help! What is meant by biomechanical changes? This is a great article. I have 3 marathon under my belt. First one was horrible, with whole body fatigue at mile 19. I finished but had walk/run (mostly walk) the rest of the way. The follow year I cramped at mile 23 but was able to push through at a slower pace. I knocked off 1.5 hours off my previous time. I took 7 years off of running and got back into it. I spent 5 months to build my base and then trained for 18 weeks following Pfitzinger’s 18/70. I found my base was not enough for the training and I found myself not able to keep up with his recommended pace. I was able to do the miles although I kept getting sick (colds) and getting injured (DOMS), and calf soreness. With only 70% of the training I missed my goal but was able to equal my time of the my previous marathon. Cramping at mile 25. After reading this article it kind of reinforces my thought that I didn’t have enough electrolytes during my first marathon. I took salt stiks and gu during the last two marathon. The last two marathons the cramps were due to muscle fatigue. I ran a positive split both times, unintentionally during this last marathon, so I know I have to get used to running on tired legs and doing tempo runs. But its so hard to maintain marathon pace on tired legs for 6-10 miles. It maybe I just haven’t accumulated enough miles under my belt yet. We have lots more articles that can help you, just sign up for our newsletter anywhere on this page, and we will send them directly to your email! Hope this helps, best of luck! What’s the difference between electrolytes and isotonics.